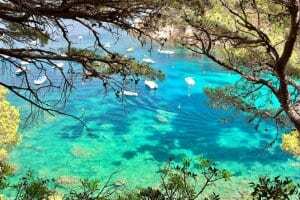 Catalans are very proud of the Costa Brava (The Rugged Coast) and with good reason – despite the inevitable development, much of the coast has remained wild and untamed. Sheer cliffs, crystal clear water, sand and pebble beaches, and enchanting villages combine to make much of this coast a joy. Indeed, visiting picture-postcard destinations such as Begur is a favorite day trip for Catalans, and increasingly, discerning sybarites from abroad. Evidence indicates that Paleolithic (Old Stone Age) people wandered around what is now modern-day Catalunya as long as 70,000 years ago. Subsequent tribes rubbed along pretty much undisturbed until the 7th century BC when the first Indo-European invasions took place. Waves of these more advanced tribes, particularly Celts, poured into Spain from northern Italy, Switzerland and beyond. They were soon joined by usurpers from the Mediterranean – The Phoenicians and Greeks. However, by the 3rd century BC, two superpowers had emerged in the Mediterranean: Rome and Carthage. After fierce fighting, Rome eventually emerged triumphantly and by 197 BC all of the Spanish peninsula was under Roman control. They divided Spain in two: Hispania Citerior (including what is now Catalunya) had its capital in the Roman city of Tarraco (Tarragona), while the rest of Spain was dubbed Hispania Ulterior. Christianity also arrived by the third century AD, and the Romans held onto Spain until the 4th century. But, as the Roman empire began to wobble, Hispania felt the effects. After the Franks invaded Catalunya, the comparatively Romanised Visigoths arrived and made Toledo their capital. Yet their rule remained unsettled to the end, paving the way for the Moors to invade southern Spain in 711. Their leader Tariq found the Visigothic ‘state’ so rotten and divided that he had no trouble subjugating the peninsula. All of Catalunya found itself under Muslim control from as early as 718 but the situation did not last long. Indeed, parts of Catalunya were never conquered by the ‘Saracens’, as the Muslim warriors were known. By the late 10th century the Casal de Barcelona controlled parts of Catalunya and the Languedoc-Roussillon in southern France. Muslim raids continued in the 10th century, however, by the late 12th century their presence in northern Spain was greatly diminished. Under the rule of Ramon Berenguer III, the city of Tarragona was retaken and Catalunya launched its own fleet and sea trade developed. This was a glorious era for the region, with the rise of great Catalan Romanesque art. In the 11th century, the first recorded mention of Begur took place. This part of Catalunya was ruled by the first Lord of Begur, Arnust de Begur, from which the village takes its name. 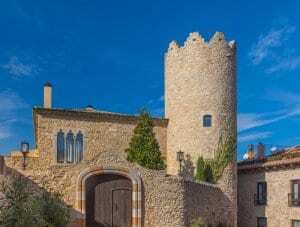 During this period a castle was constructed on a rock above Begur. This castle remains pretty much in the same state in which it was left by Spanish troops who wrecked it in 1810 to impede the advance of Napoleon’s army. In 1137 Ramon Berenguer IV married the heiress to the throne of Catalunya’s western neighbor, Aragon, thus creating a joint state that set the scene for the region’s golden age. The most famous Catalan ruler was Jaume I, who conquered the Balearic islands which were used as pirate bases to strangle Catalan sea trade. After a series of costly and often bloody campaigns, the western Mediterranean was turned into a joint Catalan/Aragonese lake of prosperous trade and riches. These were high times indeed for the citizens of Begur and wider Catalunya. However, in 1479, Fernando of Aragon married the Queen of Castile Isabel, uniting Spain’s two most powerful monarchies. In 1492, the last of the Muslims were ejected from Granada and in that same year, Columbus discovered the Americas – an event that in a short time would bring enormous wealth to the now united Spain, but from which the Catalans would benefit little. Yet Begur subsequently benefited enormously from the trade in coral – the Costa Brava was once renowned for its prized red coral, which survives today at great depths. Watchtowers were also built in the 16th and 17th century and were used to protect the coast against attacks from pirates. By the 17th century, things were not looking up for the citizens of Begur. The Reapers War (1640-52) saw Catalunya declare itself a ‘republic’ under French protection, but ultimately the final peace treaty that concluded hostilities between France and Spain saw the region lose valuable territory, including Roussillon. Catalunya seemed doomed to stumble from one losing cause to another – in 1714 King Felipe V took Barcelona after a long siege, a black day in history for all Catalans. He abolished the local government and banned teaching and writing in Catalan. Nevertheless, the 18th century was a generally prosperous time for all of Catalunya. The textiles industry – benefiting greatly from trade with the Americas – boomed, while cork, paper, liquor and leather exports all generated considerable wealth for the merchants of Barcelona. Begur became a favorite weekend destination for the middle and upper classes, although fishing was the mainstay of the village’s economy. The 19th century was marked by seesaw political clashes and conversely economic growth and prosperity. Industry centered around Barcelona expanded, while the movement to reinstall Catalan autonomy in economic and political matters grew and grew. Yet all was not well and a popular revolt in 1842 led to a bombardment of the city. Catalunya greeted the 20th century with a sense of optimism that was sadly not to last. In 1932, the government of Madrid finally bequeathed what the Catalans so desperately desired – a new regional government and some degree of autonomy. But, events of greater importance than Catalan nationalism would drag Spain down a dark path. In 1936, General Francisco Franco rose up against the Spanish Republic and eventually captured Madrid in March 1939. However, even before the end of the war, Franco made the symbolic act of abolishing the Generalitat (in 1938). Up to 35,000 people were shot in his post-war purge and Catalans lost many freedoms. Franco banned the public use of Catalan and had all street names rendered in Spanish. Since Franco’s death and the return to democracy, Catalunya has sought ever more autonomy, taking control of a range of areas including police, education, trade, hospital and social security. They are a proud people and justifiably so – Catalunya remains one of Spain’s most enchanting regions, typified by the dynamic internationalism of Barcelona and the tranquil beauty of the Costa Brava. The best analogy we can think of is to imagine a far less crowded Cote d’Azur – Begur’s lovely climate, spectacular coastal scenery, narrow streets and enticing restaurants add up to something quite special. No wonder Begur is singled out for special treatment, even among the many treasures of the glorious Costa Brava. The Costa Brava and indeed wider Catalunya are wonderfully self-sufficient in the gastronomy stakes – the region’s diverse geography and topography provide a bounty of delicious produce, meat, seafood, and game. After all, this region is home to the legendary El Celler de Can Roca in Girona, voted Best Restaurant in the World twice by Restaurant Magazine. Michelin fine dining, rustic boltholes, dreamy sea-facing terraces – all of this and more is up for grabs in the Costa Brava. Mar I muntanya (sea and mountain) is a key part of the regional diet, and Catalans delight in pairing meat and fish to create unusual but delicious combinations, such as meatballs with cuttlefish and chicken paired with shrimps. Cured meats, above all sausages, are another Catalan passion – you’ll find all sorts of sausages on menus in the Costa Brava, including botifarra, fuet (a thin, dried pork sausage) and longanissa. Wild mushrooms also elicit strong emotions and foraging in the woodlands set inland from the coast is a real treat for food lovers. A multitude of species flourish in the fall in Catalunya, too many to mention here although the large succulent rovellons are our personal favorite. 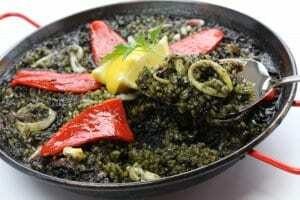 Visitors must also try the famous arros negre, rice cooked in cuttlefish ink that may sound off-putting but is in fact exquisite. Fideua is another Costa Brava highlight – similar to paella, Fideua uses vermicelli noodles as the base and is served with lobster and prawns in the best seafood restaurants. Whilst perusing the menu, keep a lookout for local cheeses such as formatge de tupi, a goats’ cheese soaked in olive oil that is utterly delicious. The main centers of cheese production in Catalunya are in La Seu d’Urgell and in the Pallars area in the north-west. Meanwhile, oenophiles will be asking – what can I expect on my wine list? A great deal is the answer: Catalunya is no less self-sufficient in the wine department and is home to several major DOs (wine zones) in addition to being renowned for its sparkling wine, called Cava. The majority is made in Penedes, south of Barcelona, while closer to Begur you’ll find the region of Emporda, formerly known as Emporda-Costa Brava, stretching right up to the French border. A wealth of wine styles are made in this up and coming region, including rose, Cava, and robust reds and aromatic whites. Grenache and Carignan are heavily planted, although one can find many different grapes in the vineyards of Emporda, both local and indigenous varieties. Family-owned wineries tend to dominate, our favorite being Mas Oller. A fastidious dedication to quality, excellent terroir, and even better winemaking – the wines of this boutique winery are well-worth seeking out. Offering spectacular views of the surrounding coastline, Begur’s castle, or rather its remains, dating back to the 11th century. Laid waste in 1810 by Spanish troops fearful of it falling into enemy hands, it nevertheless offers the best vantage point for miles around. Six kilometers inland from Begur is the pretty walled town of Pals. Apart from its charming medieval center, the main attraction is the 15metre Torre de Les Hores (clock tower), although wandering around the uneven lanes of the Casco Antiguo is a joy in itself. Who could resist the charms of Fornells? A tiny village, Fornells captures hearts because of its beautiful location on one of the most picturesque bays in the Costa Brava. A marina, spotlessly clean beach, and dreamy blue waters await. Salvador Dali bought the Gothic and Renaissance mansion – which includes a 14th century church – in 1968 and gave it to his wife Gala. It is a fascinating testament to his genius, done up in his inimitable style, with lions’ heads staring from the tops of the cupboard statues and elephants with giraffes’ legs in the garden. A weird and wonderful must-visit attraction in the Costa Brava.